Do you have a partner or significant other? Do you choose to be single? Are you dating outside your race? Do people consider your relationship “unconventional?” Join us for an open dialogue and discussion about the various dynamics within these relationships as they pertain to the black community. Come willing to share your experiences, but leave your judgement at home. This is a time for us to reflect on the impact that these relationship dynamics has on us so we can work to foster healthier relationships among our community. 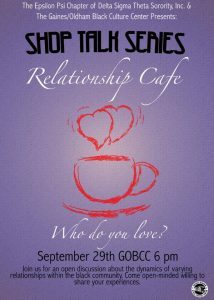 This event is Thursday, September 29th from 6-8pm at the Gaines Oldham Black Culture Center. Co-sponsored by Delta Sigma Theta sorority, Inc. Epsilon Psi chapter.